Although the formation may have been in the field for 5-6 weeks prior to sampling known (thus increasing the chance that the observed blackening was a common fungus known as Ustilago,) because of the intensity of the black color the question was raised as to whether in this case it might be due to carbonized tissues. Laboratory Results: Infrared spectroscopy was carried out by analytical chemist, P.A. Budinger, Frontier Analysis, Ltd [full report attached]. The IR spectra of material from the blackened areas of the samples were found to be identical to the IR spectrum of Ustilago fungus (IR spectra, cover page). No carbon was detected. Discussion: In recent years many Canadian maize formations have shown multiple new plant effects (massive incidence of expulsion cavities-as many as 8-9/stalk- found in all or nearly all downed plants, as well as multiple clean vertical breaks at nodes near the base of the stalks), which may indicate an increase in the intensity of the heating component of the energy system responsible for creating more recent crop circles. 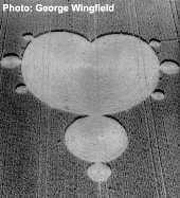 These observations, in conjunction with the published evidence (1994; 1995; 1997) that a heating agency (probably microwaves) is responsible for the presence of expulsion cavities found in previous crop formations, motivated the request for this analysis. Fieldworkers examining maize formations which are more than a week old when found (particularly later on in the season) are very likely to observe a more intense blackening instead of the grey spotting often observed after a few days. The longer the time period which has elapsed since the plants were flattened, the greater the likelihood the Ustilago fungus will become more concentrated. If carbon is present one should be able to detect the smell of charring; and carbon will most likely come off when rubbed, leaving a soot-like substance on the fingers. Fig. 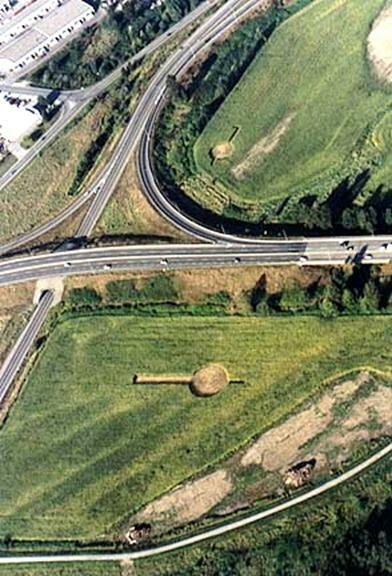 1: The two maize crop circles (#1 at top, #2 at bottom) at Mission, B.C., Canada, (September 2002). Aerial photo taken after bottom formation (Mission #2) had undergone first addition. Samples of blackened corn stalks were taken from the center of the (Mission #2) circle, a section of the original formation. Fig. 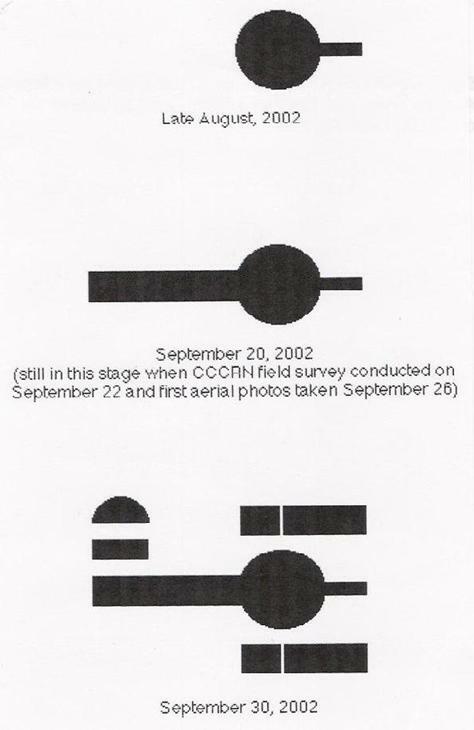 2: CCCRN diagram showing the Mission #2 formation as it first appeared in late August, then with the first addition on September 20th, and then style as it looked on September 30, 2002. Fig. 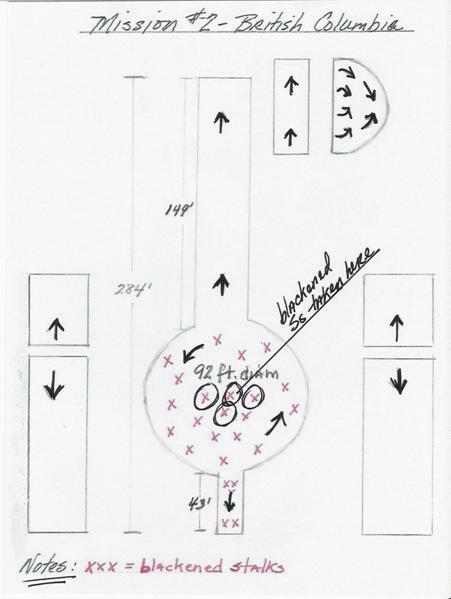 3: Field diagram showing measurements, direction of crop lay and sampling location. leaves are also Ustilago, in its more commonly observed (less concentrated) form.